Mrs. Harris was laid to rest beneath this granite tombstone in Roberta City Cemetery; Crawford County, Georgia. Today's beautiful epitaph is from Henry Wadsworth Longfellow's poem Evangeline (canto I, part the first). of 88 Years." 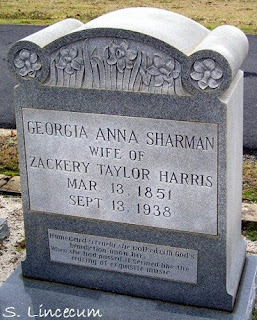 The 13 September 1938 item goes on to state, "Mrs. Georgianna Sharman Harris, 87, known throughout the nation as the oldest hotel keeper, died at her home here in Roberta today. Mrs. Harris and her husband have been active in Georgia hotel business since they began in Knoxville in 1879. Mr. Harris died several years ago and Mrs. Harris was stricken with a heart attack last Monday." (1) Source given at the Family History Files of Rozine Britt-Bickel: taken from "Crawford County Sesquicentennial (1822-1972)," Roberta, Georgia, November 16-19, 1972, page 44. Which took it from the "Georgia Boniface," a paper devoted to hotel interests in Georgia.